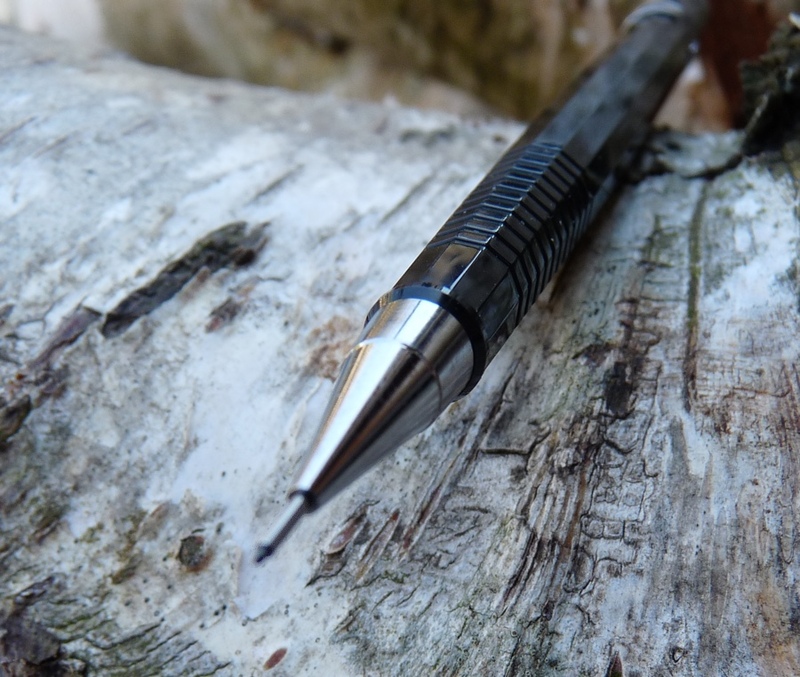 Pentel P205 Mechanical Pencil Review – Pens! Paper! Pencils! The Pentel P200 series are mechanical pencils available in 0.3, 0.5, 0.7 and 0.9mm lead sizes. The 0.3mm is called the P203, this 0.5mm version is called the P205, and so on. The different sizes are also different colours, making them easy to select. They cost about £6 in the UK and $8 in the USA, where it is also known as the Pentel Sharp and, as far as I can tell from this side of the pond, also comes in a wider range of colours. Pentel Sharp is a very apt name, as you shall see. This pencil was sent to me by Pentel for review purposes. These are my honest opinions. The barrel is hard plastic with a moulded grip section. It’s nothing spectacular but it’s robust and reasonably comfortable to hold. It’s made to be thrown about, pocketed (carefully), used with care or used in haste. The lead is held firmly within a 4mm sleeve. The push button advances the lead reliably and in sensible increments. The removable metal clip isn’t the strongest but does serve its purpose. There is the usual tiny eraser under the cap. It does erase, so that’s something. The P200 series is famous for being good value and robust and this is well-deserved. 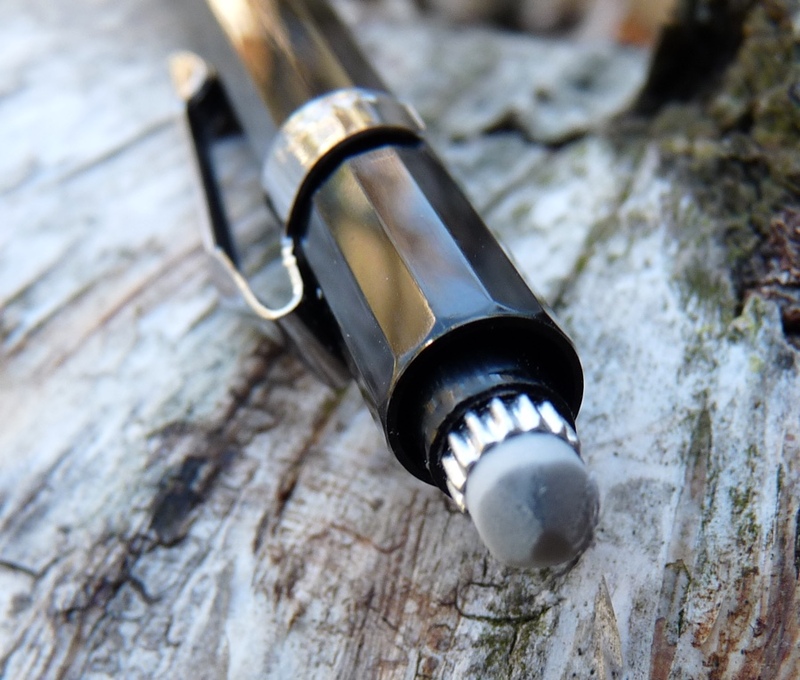 The Wirecutter included it in its list of Best Mechanical Pencils. It’s also famous for being quite pointy (sharp, even) and it is, in fact, the only writing implement I own that’s drawn blood. My own blood, in fact. It is very pointy. This pencil and I got off to a bad start, due to its overly violent nature. However we’ve made up now. At this price point its only real competition is the Uni Kuru Toga (the basic model, not the one I reviewed). Both are great pencils at bargain prices. There was a brief, happy time during which the stationery cupboard at the job I was in at the time was stocked with these. I selected a P-207, and was very happy with it indeed. 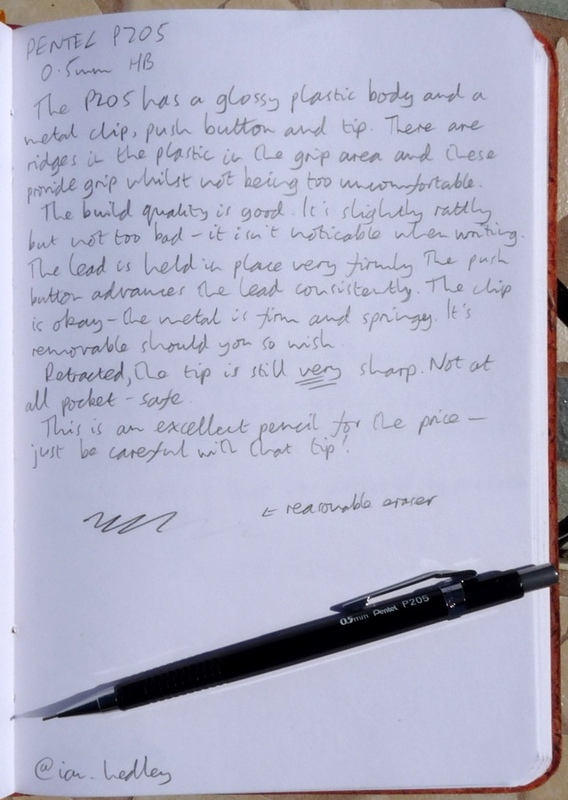 Despite their simplicity, I think there’s something satisfying about them – the lead advances just the right amount, the grip works, and you don’t feel nervous leaving them on your desk. I think, although I wouldn’t swear to it, that a rebadged version was available from Impega for a little while too. I have an identical pencil except it has a MICRO Korea stamp on the barrel and on the clip. I wonder if you ever encountered one. I gues it’s an OEM version from the production facility that turned out some unmarked version. Interesting! No I’ve not seen one like that before. I also own one as well. It is a Emicro Jedo 1000. I hope that this helps, please have a great day. I’ve used these pens for many, many years. The P205 is my favorite; electrical eng in a industrial plant until I retired. Do you know how long these pencils have been in production? I own one of these pencils today, and I owned one when I became a draughtsman nearly 40 years ago. So I’m interested to find out how old this design is. Pentel have been making mechanical pencils since the 60s but I haven’t been able to track down when the P200 series was first made. I suspect it was an early model though.